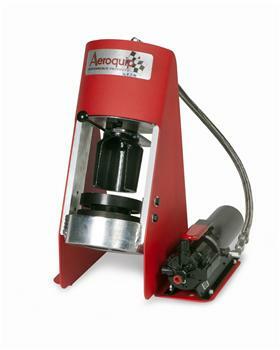 Aeroquip Tools - Hose Crimp Machine UNIVERSAL - Lesher Motorsports, Inc.
Relaunched with a sleek new housing, the new high performance crimper will compliment your high performance shop, race trailer, or garage. Eaton Aeroquip AQP Racing and StartLite hose in sizes –4 through –16, straight through 120˚ swivel. The StartLite hose is also qualified in –20 swivel. The performance version of the ET1000 builds on the success of Eaton portable crimp machines by using a 2-piece split half collet assembly in lieu of traditional one-piece die cages. The correct hose assembly crimp diameter is obtained by the use of a spacer ring that controls the stroke length of the cylinder during the crimping operation. This ET1000 may be ordered separately or with one of one of two different power sources: a two-stage hand pump or the Air-Hydraulic pump. The crimper housing has been expanded to allow for a direct mount on the pump to the housing. Pusher slides out of position. Crimper body has a clear zinc finish to protect against corrosion. Spacer rings control the crimp diameter. Qualified to crimp Aeroquip’s top selling hoses: AQP Stainless Braid, StartLite, and Teflon hoses with Aeroquip’a qualified aluminum crimp fittings. Sliding pusher allows for easier fitting insertion into the machine. Simple positive-stop crimp diameter control system for consistent crimping time after time with no operator adjustments required. Easily transported between job sites. Versatile power source options. Electricity is required only when using an electric style pump.